A superb riverside location + hugely luxurious and spacious suites + fantastic game viewing + unmatched intimacy (just 3 suites!) = SENSATIONAL! 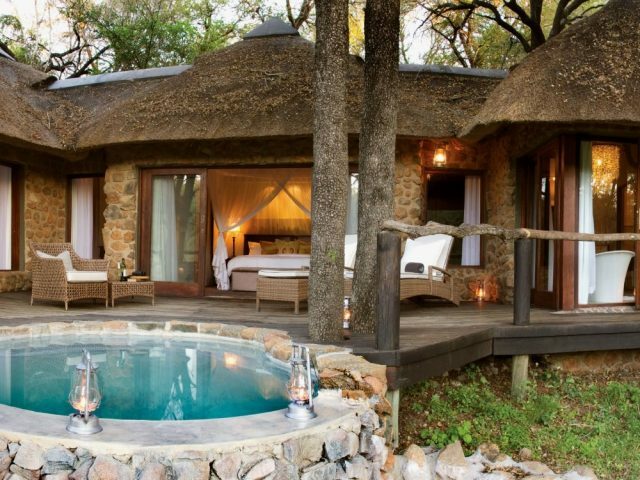 With just 3 suites usually occupied (4 if you book out the lodge exclusively) Leadwood is one of the most exclusive and intimate, romance-friendly lodges we’ve ever come across in our travels! The massively spacious and luxurious suites are wonderful places to spend a romantic holiday: outdoor showers, fireplaces, private pools, heated bathrooms with massive tubs…you may find yourself tempted to remain ensconced there for the duration of your stay, only emerging reluctantly for the odd meal! 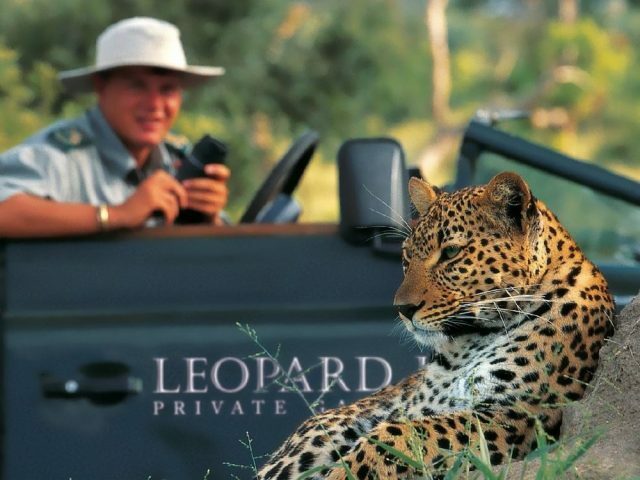 Of course you’re in the middle of some of the very best game viewing country in Africa, with leopard a particular speciality – and with just 6 guests allowed on the game drive vehicle you’ll get to enjoy the great viewing in space and comfort too. The name “Dulini Leadwood” might lead to a little confusion. Why? Well for many years the lodge was called Exeter Leadwood and fell under the well-known andBeyond stable. However, mid-2016 saw the lodge’s management and marketing switch to the boutique but top-notch Dulini brand where it promises to reach even greater heights. IS THAT 3 ROOMS OR 4? We mentioned previously that Leadwood boasts 4 gorgeous suites, but in reality only 3 of them are usually occupied at any one time. The reason for this is simple – restricting bookings to only 3 rooms means a maximum of 6 guests at any time on your game drive vehicle, thereby guaranteeing that everyone has a “window” seat with more comfort and less crowding (the unused middle seats are handy places to stash cameras and jackets) It is only when a party books the entire lodge on an exclusive basis that the fourth room would be used. Whilst the gorgeous riverine forest shields your suite from prying eyes and maximises your privacy and seclusion, the design ethos behind the beautifully appointed rooms is a breath of fresh air. And we mean this quite literally too: wide glass doors and windows stretch from toe to ceiling, fully opening onto the private open-air decks, which gives you a feeling of immersion in the bush. Fantastic views of the river greet you at all angles, whether it’s from the comfortable chasms of soft cotton on your massive bed or from the cool waters of your suite’s private plunge pool. 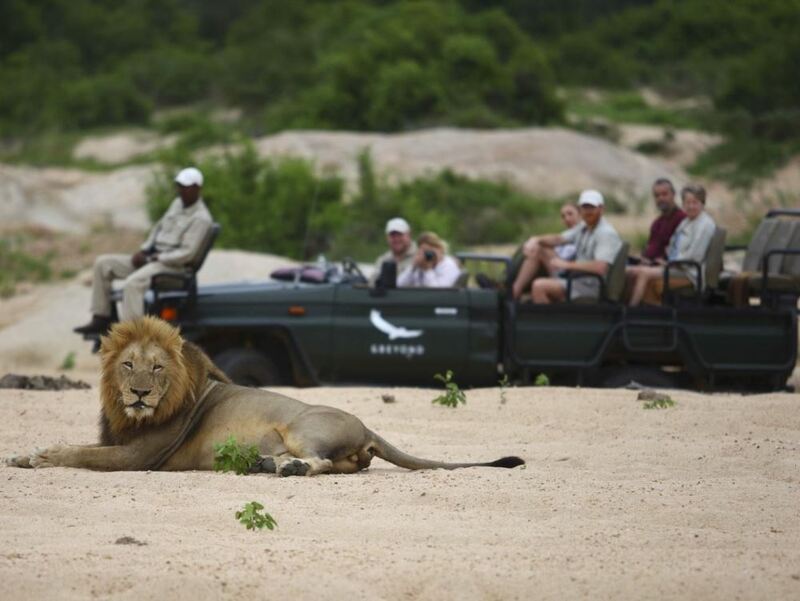 It’s not just the suites that are exciting; Leadwood’s game viewing also ranks amongst the best in the country! Passionate, friendly, and quick to explain the curious details of bush life to those of us less learned, the professional team of rangers and trackers at Leadwood ensure that drives out into the reserve are a delight and an education wrapped into one. The Sabi Sand is of course rightly renowned for its superb game viewing, with leopards being perhaps its signature speciality. Of course, if you find the hum of a diesel engine sometimes too distracting then why not head off on a guided bush walk - there is no better way to go face-to-face with the African bushveld than with your own personal guide edging you forward in complete silence, slowing inching step by step towards an unforgettable and up-close encounter with some of Africa’s most beautiful animals. 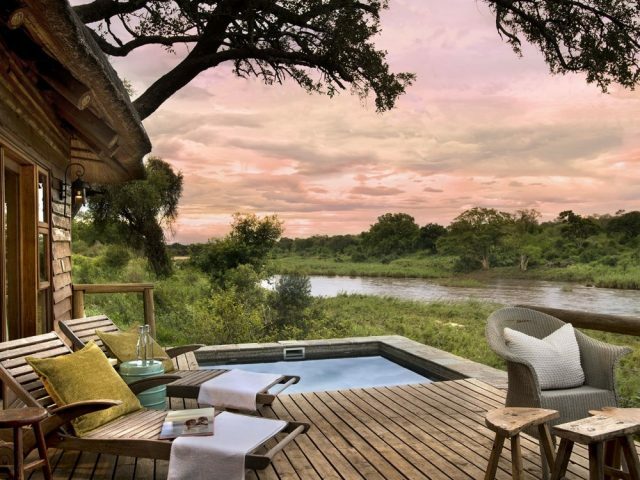 Upon returning to the lodge after your morning game drive, we’re pretty sure that most guests will choose to hang out in the privacy of their hugely spacious suite, perhaps enjoying a welcome swim in their private pool. Of course, the main lodge public areas are also extremely attractive spaces. Again, the design of the lodge seems to have been designed with intimacy in mind: almost as if they were scared that six (or eight) guests are too many, even the shared areas focus on providing a choice of various private, quiet spaces. Varying levels, steps and clever architecture come together to create cosy little nooks and crannies that honeymooners can tuck themselves into for an evening drink whilst they whisper sweet nothings. WHERE WILL WE BE DINING TONIGHT? 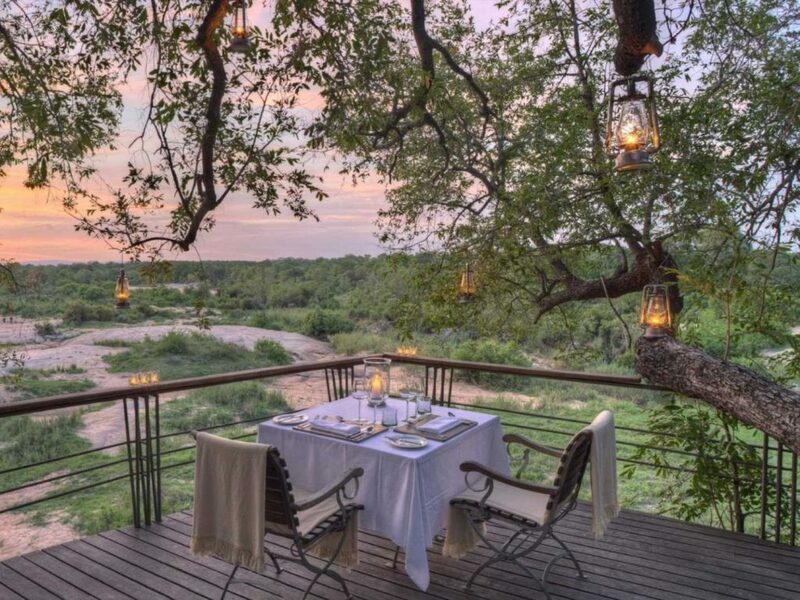 In our extensive travels across southern Africa, it’s arguable if we have ever seen a better place to spend your honeymoon or romantic break. The feeling of intimacy and quiet at Leadwood seems almost custom-tailored for this. But whether you come as a couple or as a larger group, with their attention to detail, excellent service and breath-taking rooms and setting, at Leadwood one thing is certain: when you leave this place, you’ll do so with a heavy heart. The 6 luxurious suites with (heated) private plunge pools looking out over the Mabrak riverbed provide a wonderfully romantic base for great game viewing!